If you burn wood you may have a hidden fire hazard in your chimney – CREOSOTE! Creosote is a black, tar-like substance caused by condensation of gases in smoke. In time it builds up and, under the right conditions, can ignite into a dangerous chimney fire. Glazed creosote is the worst type because it is almost impossible to remove with conventional cleaning methods. Chimney Rx Professional Grade Creosote Remover is a non-toxic and environmentally safe liquid manganese catalyst that attacks and destroys dangerous creosote and soot. It is safe for fireplace soot removal and creosote removal in all wood, coal, and pellet-burning appliances including those with catalytic combustors. Wood: Regular use of this product converts hazardous creosote to a harmless ash or char. This product helps to reduce further deposits, making the appliance safer to operate and more efficient. Coal: Soot from low-grade or improperly burned coal is a serious pollutant. Creosote Remover can significantly reduce soot and therefore reduce emissions from coal stoves. Pellet Stoves: Creosote Remover reduces accumulations of excess ash from wood-based pellets and helps to prevent the pellet feed mechanism from clogging. Gas Logs: Creosote Remover disperses unsightly carbon buildup on gas logs and helps to prevent future accumulation. The result is cleaner burning logs and a more realistic fire. 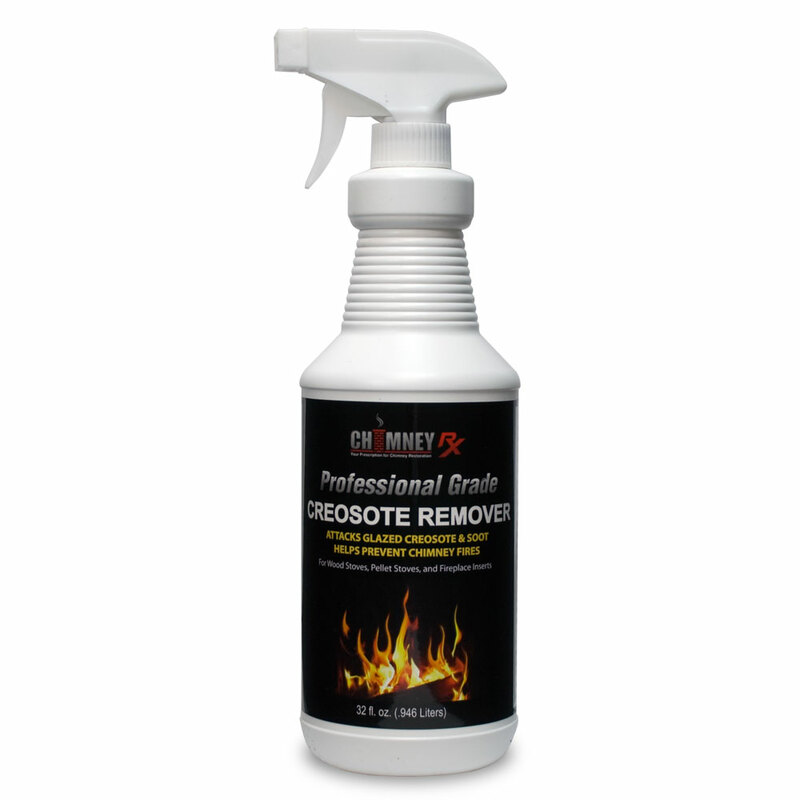 Use Chimney Rx Creosote Remover regularly to control creosote accumulation and to reduce pollution. Start early in the heating season to “condition” stoves and furnaces for efficiency. Use liberally at the end of the heating season, before shutting down. For best results use daily during the heating season. Six to twelve sprays into the firebox each time a fire is burned will prevent the dangerous build-up of creosote from occurring. Using this product is not a substitute for regular chimney cleaning. Have severe conditions inspected and corrected by a qualified chimney sweep before using Chimney Rx Professional Grade Creosote Remover.